Home » Listings » 320 Market St. 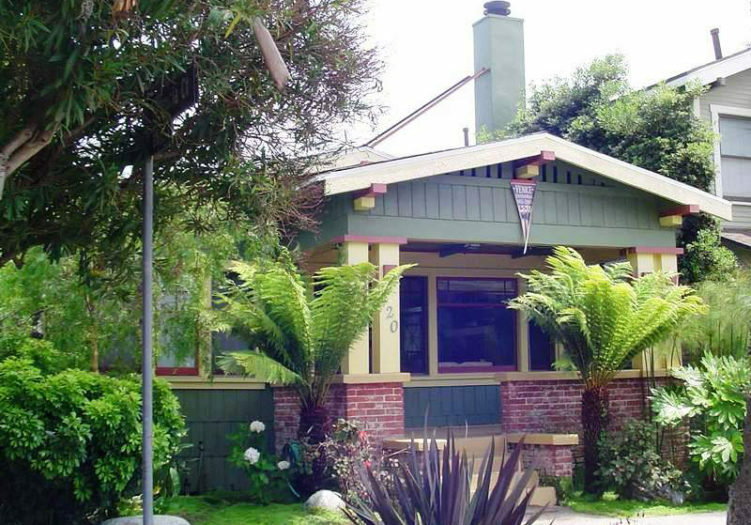 Located in Venice's Windward Circle neighborhood between the beach and Abbot Kinney Blvd., this picturesque 1913 California Craftsman bungalow recalls the vintage aesthetic while updated for today's lifestyle. The exterior features a sloping roof with bracketed eaves, a decorative entablature, multiple colors highlighting architectural elements, small paned windows and front porch ambiance. An open informal floor plan is perfect for entertaining. A custom stained brick fireplace with mantel adds a homey feeling and a skylight illuminates the living room. Plate rails, crown moldings, classic wainscoting and beaded paneling on beamed ceiling accent the dining area. French doors lead from the kitchen to bricked back yard and from the master bedroom to deck with spa. The third bedroom works as an office or guest room with Murphy bed and pocket door. A roof deck tops a finished small one-car garage. Rear gate can open for extra parking. Sale subject to sellers finding replacement property.